I am used to reading product review pitches…some are good, some are not so good, some are just ‘eh’. But this one really takes the cake. Although not your typical sweater, jewelry, perfume bottle, flowers or a day at the spa that mom’s are used to getting for Mother’s Day, why not be creative this year and show your mom how much you really care by helping to kick her bad habit and make the switch to South Beach Smoke electronic cigarettes. When mom takes a puff of South Beach Smoke’s e-cigs, she’s not exposing herself or anyone else in the family to any of the unhealthy components found in traditional cigarettes, such as carbon monoxide, carcinogens, tobacco, tar or ash. My first thought was that this pitch must be a tasteless joke. Nope, just tasteless. Nothing like enabling your mom’s addiction for Mother’s Day with these super duper healthy cigarettes. Sheesh. If you think that this a wonderful idea, and you decide to buy this product, please don’t tell them I sent you. 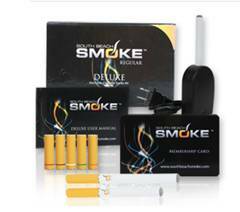 This entry was posted in Health, Products and tagged electronic cigarettes, lung cancer, mother's day, nicotine, product pitch, smoking by jessica. Bookmark the permalink. Wow. That’s just crazy. I don’t think any mom would appreciate this as a Mother’s Day present. And those things probably don’t even work. I managed to kick the habit almost 3 years ago… cold turkey.